This follows Director of Public Prosecutions (DPP) Noordin Haji ordering for fresh investigations in the case. The DPP instructed the Director of Criminal Investigations (DCI) to record a fresh statement from Kipchoge about the Rio fiasco then resubmit the file for further directions. The DPP said the investigations will be pegged on fresh evidence volunteered by Kipchoge through his lawyer Cecil Miller. Kipchoge was scheduled to appear before Anti-Graft Court Chief Magistrate Douglas Ogoti to plead to two counts mismanagement of public funds and abuse of office. The former multiple Olympics champion had been jointly charged with Nock Secretary Francis Kinyili Paul aka F.K. Paul for unlawfully authorising excess allowances to members of the Kenyan team to the Rio 2016 Olympic Games. They are accused of permitting payment of Sh15,907,500 to Kenya Team. 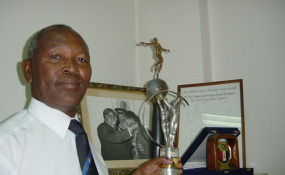 He was also separately charged with including his son Ian Kipkosgey Keino in the team then improperly conferring him $24,496 (about Sh2,496,000). But Miller prayed that Kipchoge's involvement be relooked into as he was not involved in the daily operations of Nock. "I received representation through a letter dated October 17, 2018 from Miller which discloses areas which were not covered in the initial investigations conducted in December 2016," Haji states in the evidence presented to the court. A state prosecutor Emily Kamau told Ogoti that as a consequence of Miller's request the DPP had directed his case be re-examined afresh by the DCI. The DPP directed that the Rio file be taken back to the DCI to carry out an in-depth probe as the earlier investigations did not touch on the areas raised by Kipchoge. Miller had disclosed to Haji that although Kipchoge was the chairperson of the National Olympics Committee-Kenya he was not involved in the day to day running of the organisation. "Our client did not give any authorisation for the inclusion of alleged persons into the Rio 2016 Olympic Games Kenyan Team as alleged," stated Miller.